Astronaut Peggy Whitson Sets NASA Record For Most Days In Space : The Two-Way When she comes back down to Earth this year, Peggy Whitson will have logged more than 650 days in space. She spoke to President Trump Monday morning. Astronaut Peggy Whitson became NASA's astronaut with the most time in orbit Monday. She is seen here earlier this year, along with fellow astronauts, in the Quest airlock of the International Space Station. Nearly 15 years after her first space launch, NASA astronaut Peggy Whitson has now spent more time off-planet than any other American, at more than 534 days. Whitson, 57, is a biochemist who has twice commanded the International Space Station. "It is one of those rides that you hope never ends," Whitson tweeted last night. "I am so grateful for all those who helped me on each of my missions!" Her current ride will last for at least five more months, because of an extension of Whitson's mission that is projected to leave her with more than 650 days in space, NASA says. Early Monday morning, Whitson officially broke the NASA record of 534 days in orbit that was set last year by Jeff Williams. To mark her accomplishment, she received a phone call from President Trump at 10 a.m. ET. "That's an incredible record to break," Trump said, congratulating Whitson as he spoke from his desk in the Oval Office, where he was seated alongside his daughter Ivanka and NASA astronaut Kate Rubins. "How does it feel to have broken such a big and important record?" the president asked. "Well, it's actually a huge honor to break a record like this," Whitson said. "It's an honor for me, basically to be representing all the folks at NASA who make space flight possible and who make me setting this record feasible." Their talk soon turned to Trump's plan to send people to Mars, with Whitson saying that at NASA, "we're excited about the missions to Mars in the 2030s." Moments later, Trump asked Whitson, "What do you see a timing for actually sending humans to Mars? Is there a schedule? And when would you see that happening?" When Whitson repeated her mention of the 2030s — citing space flight's need for "a lot of time and money" — Trump jokingly replied, "Well, we want to try and do it during my first term or, at worst, during my second term. So we'll have to speed that up a little bit, OK?" Earlier, when Trump asked Whitson, "What are we learning by being in space?" the astronaut replied by discussing studies about the human body's reaction to living in microgravity and how to support life during a multiyear Mars mission. Describing a solar-powered system that splits water into oxygen and hydrogen, Whitson said, "But water is such a precious resource up here that we also are cleaning up our urine and making it drinkable. And it's really not as bad as it sounds." "Well, that's good. I'm glad to hear that" Trump said, adding, "Better you than me." She had first been inspired to pursue a career in science at NASA, Whitson told Ivanka Trump, by the Apollo program. "But I don't really think it became a goal until I graduated from high school, when the first female astronauts were selected," she added. At the end of their live-streamed conversation, Whitson and her fellow astronaut Col. Jack Fisher performed forward flips in the space station. 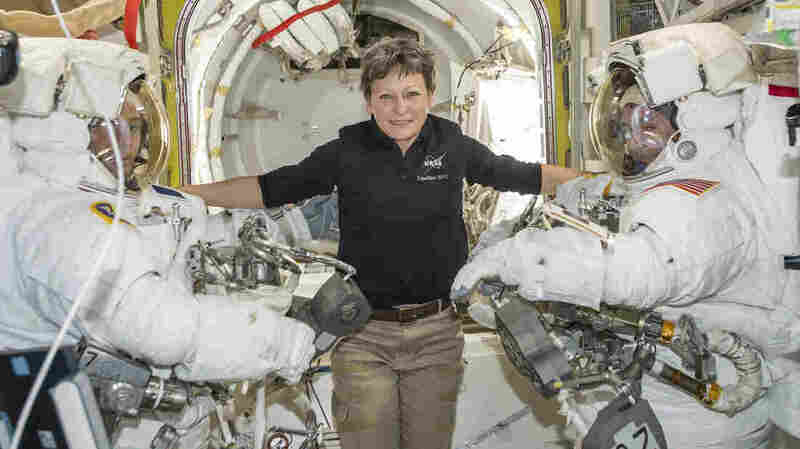 In addition to her new time-in-orbit mark, Whitson has spent more than 53 hours outside an airlock, engaged in spacewalks that added modules to the space station, among other duties. Whitson was 56 when she left for her third long-term mission aboard the space station last November, making her the oldest U.S. woman in space, as we reported. Literally and figuratively, it's been a long journey for Whitson since she started work at NASA in the 1980s. Back then, she was a researcher who supported space missions from the ground. She was named project scientist of the Shuttle-Mir Program in 1992. Four years later, she was selected as an astronaut, and in 2002, she made her first trip to the International Space Station. Whitson is scheduled to return to Earth's surface in September.